Canadian Geese are one of the few bird species that are able to digest grass, so they do well on the large expanses of lawn in parks, backyards, golf courses, farm fields, and airports. Are the bird becoming the problem, or are people keeping them around? A plane crash in New York's Hudson River in 2009 turned out to be an odd stroke of luck for waterfowl hunters. The plane, an Airbus A320 with 155 passengers aboard, hit a flock of geese as it ascended from LaGuardia Airport. The incident was dubbed the "miracle on the Hudson" after the pilot landed the plane in shallow water and no one was killed. Originally thought to be resident birds, researchers later determined the geese that collided with Flight 1549 were migratory. That didn't matter. Already a target of state and federal wildlife managers, the crash prompted new efforts to reduce goose numbers, including more liberal hunting opportunities. The U.S. Department of Agriculture also stepped up lethal control efforts, including egg oiling and euthanization, around high-risk areas. It's working, at least in some states. Virginia cut resident Canada goose numbers in half, down from 260,000 in 1997 to 130,000. Pennsylvania's goose population is down 90,000 from a high of 340,000, and South Dakota decreased resident goose numbers by 40 percent. "There's no question the increased hunting opportunities have had an impact," says South Dakota biologist Rocco Murano. "We also lucked out with a couple of low production years, including a late winter that actually froze a lot of nests." Mostly, though, extended seasons, combined with liberal bag limits, have given hunters more opportunities to kill more geese. Seasons can start as early as mid-August in some states and end in February in others. Bag limits are as high as 15 birds per day. A few states even allow electronic callers, unplugged shotguns and hunting one half-hour past sunset. South Dakota also set up a donation program that allows hunters to give their geese away to food banks during the early season. Murano doesn't know how many birds are donated each year, but he figures its well into the thousands. Are We Killing Too Many? Today's resident birds are different. They are harder to kill for one. They also are becoming more readily available which means more for fun for the hunter. Finding ways to hunt residential birds is the biggest concern, but is quickly becoming approved. A growing number of hunters think so. Resident geese used to be a widely available and reliable hunting opportunity with high success rates. Thanks largely to reduced numbers, an early-season goose hunt is anything but a slam-dunk. "There are definitely fewer where I hunt," says Virginia guide Teddy Carr, who hunts resident geese in the rolling Piedmont country of central Virginia. "We still kill them, but there just aren't as many around." He's right. The 50 percent decrease in the statewide population has translated to a significant decrease in the harvest. Hunters killed just 7,500 geese during Virginia's September season in 2014, compared to 17,500 in 2008. That's the point, says Virginia biologist Gary Costanzo. "We have to find a balance between the complaints from farmers and other landowners with the wishes of hunters. We get it from both sides. Hunters say we are killing too many and farmers say we need to kill them all," he says. "We could probably bring their numbers down even more, but we understand how important resident geese are to hunters and to wildlife watchers. Our goal is not to eradicate them, but to keep their numbers at a level that's acceptable to everyone, which isn't always an easy thing to do." Murano says his agency never intended to eradicate geese that spend their spring and summer in South Dakota, either. That would be impossible. Managers do want to see a further reduction from the current population of 155,000, though. His agency originally had a management goal as low as 80,000 resident geese, but that may change. "We are actually taking a look at our objective number," he says. "We understand the value of our resident geese to hunters, so we may bump our population objective up somewhat so we can continue to provide adequate hunting opportunities. At the same time, we have to consider the reality of the social carrying capacity of resident geese. They can cause a lot of damage if we don't control their numbers." They don't seem to be creating any conflict with ducks or migratory Canada geese, though. At one time, hunters and biologists were concerned skyrocketing resident goose numbers would displace migratory geese and otherwise negatively impact ducks and other waterfowl. That hasn't happened, at least not to any significant extent. "Resident geese wiped out a large area of wild rice in a tidal marsh in Maryland. That led to some erosion issues, as well," says Costanzo. "They may have some impact on migratory waterfowl, but I don't think it's significant, aside from a few examples." Resident geese in cities and suburbs are safe from most predators, many people like to feed them, and they are less vulnerable to hunting because they tend to live in settled areas where firearm restrictions often apply. Finding and patterning local geese that call neighborhood ponds and golf course's home isn't hard at all. Finding a safe place to shoot is, though. Patterning Canadas that call golf courses and neighborhood ponds home isn't difficult. They typically fly around sunrise to feed and come back to the roost. The hard part is finding a place to shoot them. Often during the early season, few fields have been harvested, unless you're hunting the northern states. But if the birds are plentiful, and you want to get after them, here's how. The simplest task you can complete is driving around and finding water holes or picked fields geese use. This dove season we hunted a spot right next to a refuge and saw that the birds were flying way out about 20 minutes after sunrise, with a dozen or so returning around 9:30 a.m. to a small farm pond. There's nothing wrong with taking two buddies to a spot like that and doing the Lord's work. You're not educating birds if you kill all of them. If you're in a field where birds want to be, is there really a point to blasting honkers with your catalog of calls? This applies when the migration is on too, but particualry in August and September. Just hit birds with some low-volume feeders and moans. Cluck at them a little bit. Tease them with a flit of the goose flag. But do not make those five-alarm high-pitched pleading calls, you will not enjoy the results. Don't do all the work of finding a good feed just to slack off when it comes to grassing up the layouts. Remember, these resident birds have been around the block, presumably using the field for a couple days, maybe more. Take the time to hide under as much cover as you possibly can. Corn is pretty easy to stay hidden in, wheat fields or pastures, not so much. If you have to hunt the latter, try and find and overgrown area or fencerow to hunt from. If that's not possible, dig in the layouts, or try a stand-up blind like Zink's Avian-X A-Frame — just be sure to brush the heck out of it. The special early seasons are short, so you might not have time to let a field build with birds as much as you might like. Sure, it's great to get 100 local Canadas in some cut corn and have at it. But if you're staring the last few days of the seaosn in the face and there's only 50 birds on the feed, well, do you want to shoot some geese or don't you? OK, OK, growing up dad told you never to shoot the roost. And he was right. But there's a caveat. If the season is ending, why not? After all, the reason these early seasons exist is to thin the flock, and if a farmer is waving you off, then make it rain someplace else — even if it's over water. 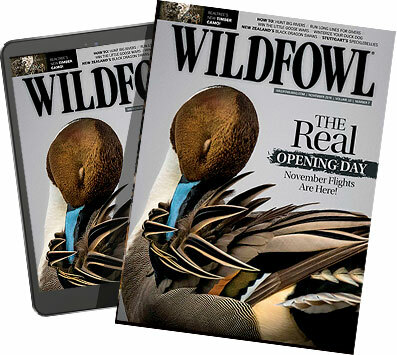 See full article in the November 2015 issue of WildFowl Magazine.